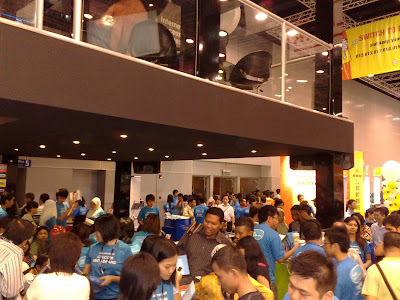 Final PIKOM PC Fair for 2008 is having from 12th till 14th December, 11am to 9pm, at Kuala Lumpur Convention Centre, Mahkota Parade Melaka(Malacca), Dewan Suarah Bintulu(Sarawak) and Batu Pahat Mall(Johor). Oh well, since now I’m KL, go to KLCC for sure, at the same time will miss the chance to go to Malacca’s PC Fair, since I will be leaving to Malacca from the 15th December till after Christmas. As usual, my insane gang, M.E.A.N., planned to go on Friday(we will go everyday for most of the time, but not this time, because I got nothing special to grab and lazy). 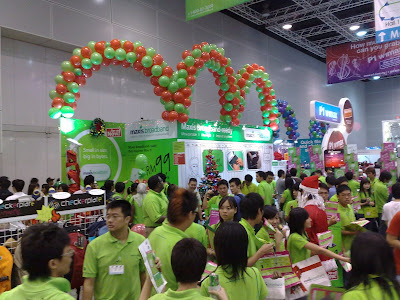 Unfortunately, M(Manything), got to work in PC Fair and could not follow us to round and round and round the PC Fair. A(Anything) will catch-up later because he got a performance to perform, lucky you A(Anything), or else we will keep snapping you during your performance, hehe. So, me, E(Everything) and N(Nothing) gathered at 10am and straight away headed to KLCC with Putra LRT, currently known as Rapid KL. 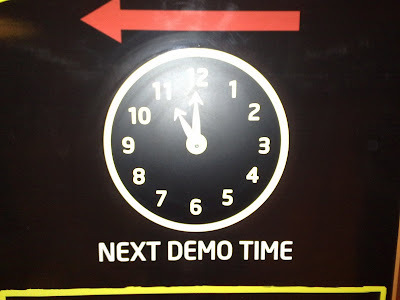 Begin at 11am, but we go that early? The journey is just like 15 minutes! LOL! Expected nobody will reach that early, but yet, again, expect the unexpected! Doesn’t care these Homo sapiens were old or young, tall or short, thin or fat, everyone is queuing up at EVERY entrance, note that, every entrance! 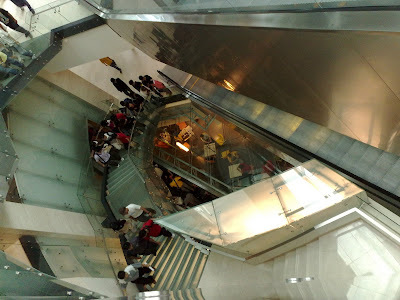 Once the glass sliding doors opened, everyone rushed in like a mad dog, I mean it! OMG, do we have to join them to run? Nah, we wanna enjoy the day, not rushing for it. Too bad I couldn’t manage to take a picture of it, but at least I can show you the crowd-ness for Friday’s PC Fair, if you don’t know, Friday will be least people. And of course, the craziest will be on Sunday. Sorry for the blurness of all pictures. This time, as for our missions, me, just wanna grab some printer’s cartridges and 50 pieces of DVD-R, planned to get a 8Gb MicroSD for my phone but then I counted, a 4Gb MicroSD is more worth than a 8Gb MicroSD, regardless the brand, well no choice but to postpone it. As for N(Nothing), he got a “major” project, which was to get a new Desktop, target will be an Acer Aspire Desktop or a Dell XPS Desktop. A(Anything) and I will guide this N(Noob)(Nothing) to choose a perfect computer. Although N(Nothing) has felt in love with these two Acer Aspire and Dell XPS, however, he wanna try his luck to get the latest Intel Core i7 Processor with XGb DDR3 1333Mhz RAM and of course with a minimum Graphic Card with 512Mb DDR3! Brand? Don’t know yet. @ Intel Core i7 920 Processor <----- Latest processor for now! @ Asus P6T Deluxe X58 Mainboard <----- 3 years warranty as usual. @ Asus 3Gb DDR3 1333Mhz RAM <----- Highest DDR RAM for now! @ Asus ATI Radeon HD4830 512Mb DDR3 <----- FYI, it is a 256 Bitrate. @ Western Digital 1Tb SATA Harddisc <----- 1 Terabytes, not enough?! OMG, a SUPERB Desktop, the price is damn freaking reasonable since it has the latest Intel Processor! The person who wanna get the Desktop was not as excited as I do! At the end, N(Nothing) has to turn down this crazy offer, for the time being. Theoretically, it was not N(Nothing) who wanna turn down this offer, but his dad. Long story... Anyhow, all the best to you N(Nothing), just wait for your dad’s arrival soon, from somewhere. Anyway, those who wanna know where to get this ‘little monster’ Desktop, please visit Hall 4, Booth 417! For your info, left 1 more FREE Samsung 21.5” LCD! So hurry up! Price, check yourself, very reasonable. After surveyed the first round, A(Anything) rushed to join us, haha. 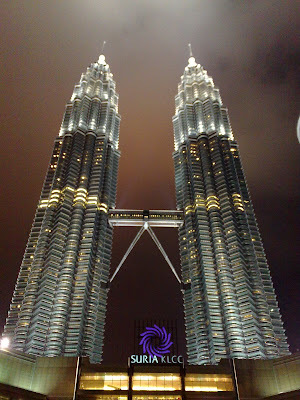 Reached KLCC, the first thing to do is, eat…… However, it was lunch time and everyone was starving. So and so, we walked the whole PC Fair for SIX rounds! SIX SIX SIX SIX SIX SIX!!!!!! Never happened before so far, this will be our own new record after the last few PC Fairs, it was 4 or 5 rounds previously. 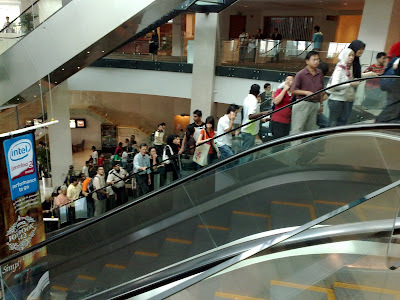 If you never walk before KLCC’s PC Fair, you might want to try it some day, 1 round might be enough, just try it, if 1 not enough, go for 2nd round. 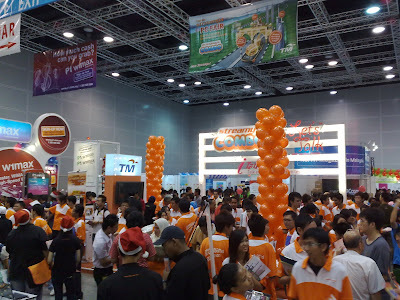 This time, the PC Fair was so full with delightful colours, especially at Hall 5. Just look at the pictures below and you will get what I mean. 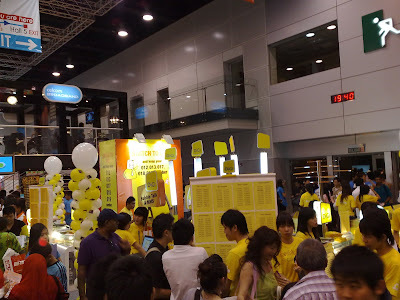 Yellow colour - DiGi Postpaid. 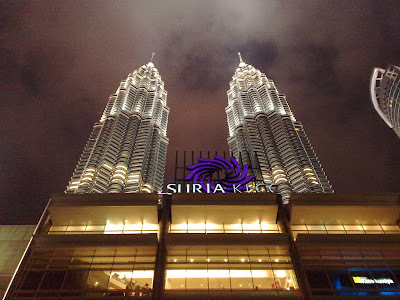 Three of us walked till the PC Fair nearly close, then, we enjoyed the wonderful night view of KLCC Twin Tower with the background of ‘Sky on Fire’. Pictures at below, click to enlarge. Cool? Sky on fire. It's gonna rain soon actually.